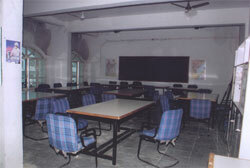 The college has a fairly large library which is located in a spacious Hall. The library subscribes to a wide range of national and international journals and periodicals covering variety of Scientific and Technical fields highly relevant to disciplines of interest to the teachers and students of this College. It has a good collection of books and important Scientific and technical compendia/encyclopedia. It also has an internet ready computer. Copyright © 2006 Shadan College of Pharmacy. All rights reserved.